Excellent report from Gallup: Worth a read, but if nothing else–please check out the Executive Summary below. T he majority of managers working in the U.S. today are wrong for their role. That’s not to say these people don’t have talent. On the contrary, their talent probably made them quite successful in their previous, non-managerial role. But the talent that makes someone a great salesperson, accountant or engineer is not the same talent that makes him or her a great manager. In fact, Gallup has found that only 10% of working people possess the talent to be a great manager. Gallup defines a “manager” as someone who is responsible for leading a team toward common objectives. This individual takes the direction set forth by the organization’s leadership and makes it actionable at the local level. Companies use outdated notions of succession to put people in these roles: They base hiring and promotion decisions on individuals’ past experience or tenure, or they give them the manager job as a “reward” for their performance in a completely separate role. These organizations overlook talent, and when they do, they lose. They spend needless time and energy trying to fit square pegs into round holes. Their managers are not engaged — or worse, are actively disengaged — and through their impact, Gallup estimates that these managers cost the U.S. economy $319 billion to $398 billion annually. Organizations that choose managers based on talent, however, have a much greater chance of choosing high performers. Naturally talented managers know how to develop and engage their employees. They create enthusiastic and energized teams that focus on moving their company forward and doing right by their customers. Based on Gallup’s extensive research and analysis, this report includes an in-depth look at what distinguishes great managers from the rest. The report helps leaders understand how to create talent- based human capital strategies that put more great managers in place and ultimately empower their organizations to tap into their greatest potential — their employees. Previous PostPrevious What’s More Important: Discipline or Intentionality? Next PostNext Are you strange, or authentic? 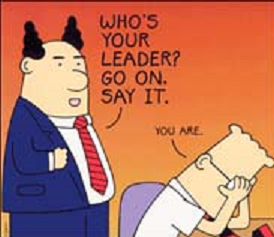 Why leaders need to be real.